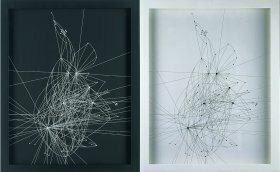 This exhibition is the third in a series exploring the work of artists who use the visual language of maps together with map-making strategies and systems. Curated by Jane England of England & Co gallery, in association with the James Hockey Gallery, this exhibition is an expanded version of the England & Co exhibition The Map Is Not the Territory ii in 2002. In response to the additional exhibition space at the Surrey Institute of Art & Design, this exhibition presents additional works and installations by more than thirty artists from Britain and abroad, including Susan Hiller, Jugoslav Vlahovic, Cornelia Parker, Satomi Matoba, Tracey Emin, Jonathan Callan, Chris Kenny, Jonathan Parsons, Langlands & Bell, Sue Stockwell, Michael Druks, Wenyon & Gamble, Layla Curtis, and Kathy Prendergast. 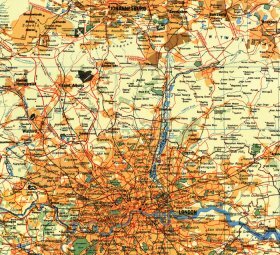 Since the 1960s artists have increasingly adopted the map as a vehicle for their ideas, and as a way of dealing with their own place in a changing world. 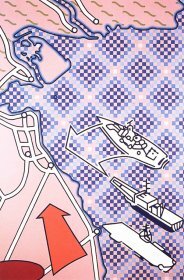 New technology has largely replaced the hand-drawn maps and atlases of the past, and artists can now manipulate cartography to create their own new maps. Japanese artist Satomi Matoba’s seamless digital manipulations produce maps that merge Pearl Harbor with Hiroshima in a utopian dream of peace and reconciliation. In By the Shores of a River she makes a convincing map of a totally re-made world with disturbing juxtapositions. British artist Simon Faithfull has digitally created a reversed world where the oceans have become the continents, and the land has become the sea. Artist and film-maker Peter Greenaway will be represented by screening his film A Walk Through H, a work in which ‘the traveller created the territory as he walked through it’. Tracey Emin’s A War Poem is movingly inscribed across a map of the Middle East, while Cornelia Parker drops meteorites on maps of towns in America that share famous place names (such as Paris in Texas), in her recent series of multiples. Chris Kenny’s Street Drawing series use map sections of various world city streets that are mounted on pins and placed in formal arrangements that echo Mondrian’s paintings of the last century – he replaces cartographic logic with an absurdist system where roads from many places ‘float and interact in unlikely combinations’. 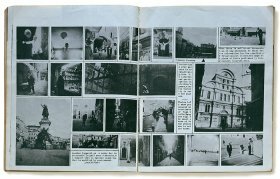 Jugoslav Vlahovic is showing his famous surrealist photograph of the 1970s, World Cow, in which the markings on a cow form a world map. Also from the 1970s are Israeli-born Michael Druks’ photographic series depicting worlds and continents made from crushed paper maps, part of his Flexible Geography project, as is his self portrait contour map, with personal territories clearly delineated. Alasdair Currie has mapped John F. Kennedy’s assassination on Lee Harvey Oswald’s bed – the presidential car is tracked through a telescopic sight in an exploration of An American’s Dream. Susan Hiller’s series of Rough Seas postcards propose Britain as ‘a thin edge between land and sea – maps emptied of internal positions’. In her computer-generated map Lost, Kathy Prendergast laboriously deleted all place names from a map of the United States except those that include the prefix ‘Lost’. Alberto Duman makes descriptive word maps of real places, while in World Political Layla Curtis subverts the normally trustworthy world map. Georgia Russell has literally dissected an A to Z of London, preserving the resulting shredded structure under a glass bell-jar. 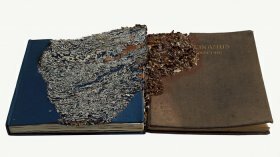 Jonathan Callan transforms books, images and objects using destructive processes to alter their original form as part of his fascination with materiality. Callan’s work has obsessive characteristics, something also seen in Jason Wallis-Johnson’s drawings and light-boxes that map islands and cities with minute dots and pinpricks to create elusive landscapes that sometimes resemble places seen from the air. Jonathan Parsons’ installation They Drew Their Plans Against Us is installed on the glass windows of the Foyer Gallery. 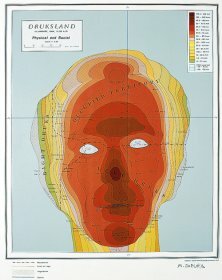 Anna Oliver’s The Gulf War explores how war maps ‘reduce experience to a series of symbols’. Alastair Mackie makes a world map drawn with dried mosquitoes in his Mosquito Coast. Emma Williams paints a London made from paper maps where the folds and undulations form new views of the city. Lee Birkett embroiders household linen with maps, incorporating found historic stains and marks. 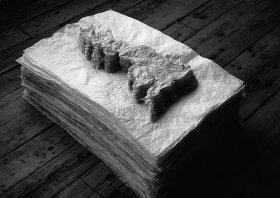 Sue Stockwell has made her UK Stack from layers of stacked tissue paper, while Joe Scotland has produced a patchwork map of the British Isles. Mounted high on one wall of the gallery is Graham Gussin’s Ghost, a disc made from a pulped edition of The Cambridge Atlas of the Stars: a map of the infinite reaches of space turned into a simple material shape.